Make exact, unlimited copies of any shape with your router! The "Daisy" Pin Router easily attaches to any router table, and performs operations similar to machines costing hundreds of dollars more. Make unlimited, exact copies of shapes from either inside or outside patterns. Repetitive cuts are easy and error free. The large, 8" arm, reaches to the center of a 16" wide piece. Includes four steel pin sizes (1/4", 5/16", 3/8" and 1/2") and instructions. Four carbide tipped bits (1/4", 5/16", 3/8", and 1/2") that match Pin Router sizes. I purchased four #10-32-3/4 screws at HD and attached the clamp with a washer between the arm and the clamp on the bottom two screws. Now perpendicular to my router table. I needed a 1/8 inch guide pin for my first project (guitar f-holes) so I purchased a 8mm-1.25x60mm bolt and nut at HD, cut it to length, ground down to 1/8 inch diameter using a file attached to a block of wood on the drill press. The guide pin looked exactly like the pins which came with Daisy. First project was perfect with this new guide pin. Second project was to remove a lot of wood on the interior of the electric guitar body. Problem was that the throw of the clamp was not sufficient to clear the wood so I inserted a 3/4 inch piece of plywood between the arm and the router table. Cleared but the guide pin was then not long enough to reach the router collet. I used a 4 inch piece of 1/2 inch OD aluminum tubing (HD) which had a perfect inside diameter of 3/8 inch. Using the 3/8 guide pin in the clamp, I positioned the pin router so the 3/8 pin fit inside the AL tubing in my table router. When aligned, I replaced the 3/8 guide with a 1/2 inch guide which was the diameter of my router bit. Again, excellent results. CONCLUSION: You can get excellent pin routing capability from your table router, but take time to make needed modifications. RECOMMENDATIONS TO MLCS: Tighten the welding specification so the pin router comes perpendicular to the router table. Include all the screws and nuts to assemble the product. Either add the 1/8 inch guide or replace the 5/16 inch with a more useful 1/8 inch guide. Either replace the pin guide lever clamp with one which would provide more clearance at the router table or include a section of aluminum tubing and explain how to align the pin with it. I am delighted to have this pin router capability in my shop at a very low price even though it did require a trip to HD and some time in my shop to make needed improvements. I received my Daisy Pin Router today and like other reviewers stated, the Pin Router Arm was not welded exactly 90 degrees (but fixable with shims) and there was missing hardware (the 4 screws holding the lever attachment to the router arm). Heavy duty and I am confident it will work well after I take care of these issues. Too bad since MLCS almost has a 5 star winner here. For only $40, I have pin routing capability at my routing table. What a deal! I do wish they had included a 1/8" steel pin in the set for more intricate routing but I can make one with a bolt, drill press and file when I need it. Received my Daisy Pin Routing Attachment today. I received an email deal that included 3 straight bits and I just couldn't pass it up. If you go with this deal, the free mirror template apparently doesn't come with it because there wasn't one in the box. The bits are more useful though. They are generic Chinese 1/4, 3/8 and 1/2" bits with a 1/2" shaft. Thank you MLCS for the free gift! The arm is constructed from heavy-duty 1.5" boxed stock, like a light trailer hitch, and the mounting flanges are thick steel plate (mic'd out a little under 1/4"). I was pleased to see the heavy stock. You can't tell from the picture but rest assured it's good stuff. The clamp for the pins and the tightening knob are light to medium duty and do the intended job well. My biggest concern, is the arm is not cut and/or welded square. From the vertical tube, down the horizontal tube, to the clamp flange there is a little more than 1/8" drop. That will cause the pin not to sit flush on the work as it goes around the the template. And since the pins have a round-over you are actually routing at an angle and not flush to the template. It's pretty noticeable. I don't know if this is a quality control issue or within specs. The fix is quite simple, shim the bottom two screws holding on the clamping mechanism with thicker washers to correct the droop and then re-tighten and measure for squareness. This is a minor issue so it's not worth returning the item. Anytime you buy equipment you should be prepared for such issues and learn to check and measure everything during the set-up process. I do think 1/8"+ out of square is excessive though and it will affect your routed piece. I dinged the rating to 3-Stars because of the arm being welded with droop. If you are prepared to handle this if it happens to you, you'll have a good working product. Great idea but cheaply made. Still better than buying the real thing. The 1/4" pin is rough turned and tapered. Looks like somebody goofed and covered it up. Pin holder needs shimmed to align square to base and the FREE mirror template ain't much at all,just a rough piece of scrap. Not sure if I will trust this company again. Works great and I am very well pleased with the performance and safety. However, it would be nice to have some larger guide pins for use with larger bits. I suggest pins in 1/8 inch increments above 1/2 inch to about 1 1/2 inches. If you have a router table that mounts the router under the table (such as the Jess em table I have), the installation will go as shown on the instructions. The instructions say to lower the pin into the collet. With the pin router's pin lowered, it stops about 7/8" above the table and the router is about 1/2" BELOW the table leaving a gap about 1-3/8". I finally eyeballed it in using a 1/4" bit and the 1/4" pin. But was very disappointed that it was anywhere near as easy as led to believe. The free mirro template that I received was poorly done. The edges were not smooth in a number of places making it unusable. Once I got the pin router lined up, it did work fine. I made 9 cutting boards and the all turned out well. A little slop in the pin adjustment, but it's solid once you tighten the set screw. Wish that they would tap the arm so the pins could be stored/kept with the base. I've been wanting to buy a pin router for my shop. But I can't afford 2000 dollars for a table-top model. 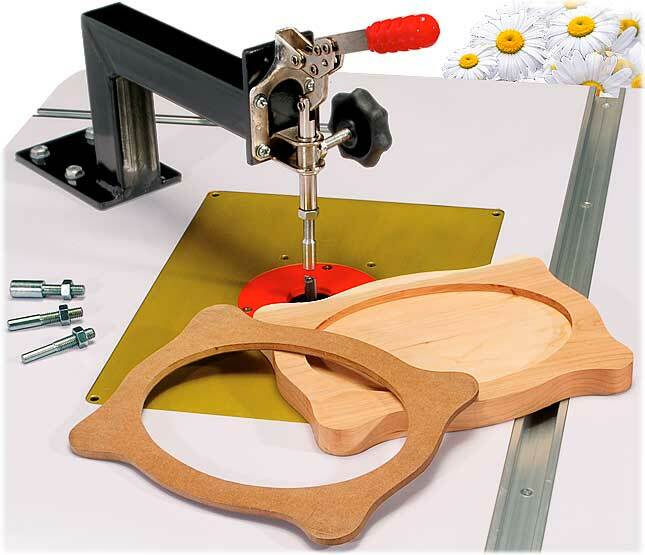 I ordered my pin router cant wait to try it out on my table!! I'm sure it works as good as all your products .....Thank you for a great website. This looked like the answer to a routing problem I was having. I was 100% correct. This setup works great and was easy to install. There was one drawback...be it very small. The unit could be a bit taller giving more table clearance. I accomplished this need with a piece of 3/4" stock for a spacer between the table and mounting flange. In operation, it is GREAT! !